iSkysoft iPhone Video Converter is a powerful and professional iPhone video converter application from iSkysoft. The iPhone video converter program has been created to convert all popular video and audio formats such as FLV, AVI, MPEG, MOV, OGG, WAV to iPhone, iPhone 3G, iPhone 3GS, and iPhone 4 supported formats including MP4, MP3 and etc. Besides conversion, it also supports a series of practical setting such as video crop, file trim, video brightness, contrast and saturation, and merging multiple files into one output file. The iSkysoft iPhone Video Converter is available in two versions such as Windows and Mac version. Support most of the popular formats such as MP4, MOV, 3GP, AVI, WMV, RM, MPEG, ASF, FLV and etc. Able to extract and convert the audio from video files to MP3, M4A and etc for iPhone, iPod, Apple TV and etc. Able to set video output settings including resolution, frame rate, encoder and bit rate. Able to set audio output settings including sample rate, channel, encoder and bit rate. Trim video files to only convert a part of a video file. Set movie video brightness, contrast, saturation and choose to apply special video effects to video files. Can preview video files before conversion and adjust the output settings. Convert video such as M2TS/MTS, MOD, TOD, AVI, MKV, WMV and audio for playback on iPhone, iPod, Apple TV and etc. Extract audio to iPhone audio like MP3, AAC, WAV for playback on iPhone and other portable players. As a special thanksgiving promotion, iSkysoft is now giving away iPhone Video Converter for Windows and Mac until 1 December. To grab the free copy of iSkysoft iPhone Video Converter for Windows or Mac which normally cost $29.95 and $19 respectively, just follow the below steps. Visit iSkysoft iPhone Video Converter promotion page. 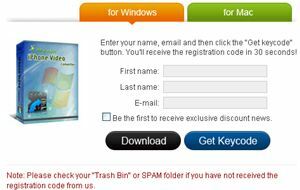 Click on “for Windows” tab, then enter first name, last name, email and click on the “Get Keycode” button. 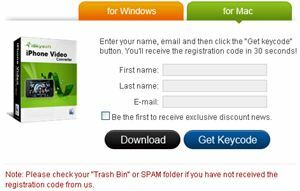 Use the received keycode to unlock and activate iSkysoft iPhone Video Converter for Windows. Click on “for Mac” tab, then enter first name, last name, email and click on the “Get Keycode” button. Use the received keycode to unlock and activate iSkysoft iPhone Video Converter for Mac.